If you’re following proper exercise guidelines and not getting leaner, there’s something else going on. The phrase “You can’t outrun a bad diet” is true for fitness enthusiasts and competitive athletes alike. Millions of people who follow appropriate exercise guidelines still have high body fat. The problem isn’t that most people who exercise aren’t doing enough. 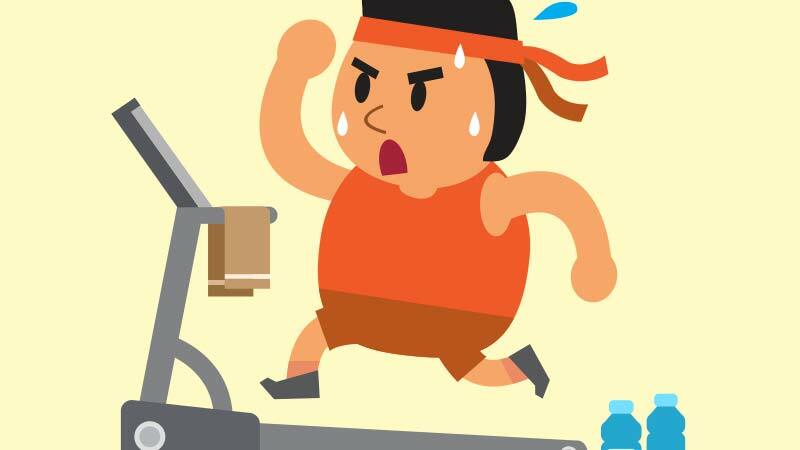 While many could be more active, the larger issue is too many people negate exercise benefits by eating poorly. Without question, exercise can potentially provide many health and fitness benefits. However, full benefits more likely occur in those with normal body fat levels. In many cases, even when meeting standard guidelines for exercise volume and intensity, the result is few benefits for many people who just want to get in better shape. Likewise, a common question of competitive athletes is why they don’t see improvement. In fact, despite the boom in recreational running, times have been getting slower for years. Many quit in frustration. Among the reasons people cite for giving up their exercise routine, and the reason many athletes quit, is fatigue and injury, and lack of real results. The latter often pertains to increased body fat. Even when exercise offers some benefits, it may not lead to fat loss. Instead of giving up, it’s better to remedy the problem. Physical inactivity is identified by World Health Organization as the fourth leading risk factor for mortality worldwide. And studies show fitness, or lack thereof, is a stronger predictor of mortality than even smoking. Similarly, being overfat also raises the risk for most common health and fitness problems. The presence of excess body fat promotes chronic inflammation, insulin resistance, increased illness and poor health, leading to increased frequency of physical injury, metabolic imbalances, and, no doubt frustration and mental stress. The benefits of physical activity on many markers of health and fitness are clear. However, researchers know that a high percentage of people who work out, in particular those with excess body fat, don’t obtain very many benefits including fat loss. It’s up to each of us to prove or disprove that exercise provides benefits to any individual. For example, we can objectively measure getting stronger or faster over time using the MAF-GPS Test, and we can assess fat loss with a simple waist measurement. Back in the 1960s, Dr. Kenneth Cooper, an exercise physiologist for the San Antonio Air Force Hospital in Texas, coined the term “aerobics” to describe a system of exercise that he devised to help prevent coronary artery disease. It included jogging, running, walking and biking. His book “Aerobics” came out in 1968 and became an immediate bestseller. Everyone assumed exercise to be very therapeutic. But since that time, while the exercise boom grew, the number of overweight, obese, and even normal-weight people who have excess body fat — referred to as overfat — has significantly increased. Obesity itself has more than doubled, as the world fell into the overfat pandemic [Link}, with the numbers continuing to rise worldwide. Athletes, elites and age-group, active military personnel, police and firefighters and other active people are not immune to the overfat pandemic. Moreover, while more people are exercising than ever, a recent study found the result has been impaired health and fitness. Researchers for RunRepeat.com found that runners in all distances from 5K to the marathon are slower than ever, and getting worse. They cited obesity, diabetes, and hypertension as possible causes for this slowdown. In addition even top age-group times are getting slower, with some records now decades old. Meanwhile, times for elite athletes are improving. Cooper’s aerobic revolution was successful on paper. It helped trigger the running boom, an even bigger walking boom, and an explosion of gyms, health clubs and other fitness centers everywhere. But the aerobic revolution failed in practice for two reasons. Many people who embraced exercise became overtrained, especially through anaerobic workouts that neglected the aerobic system. Running, cycling, sometimes even walking at too-high an intensity shifts the metabolism away from aerobic fat-burning to anaerobic sugar-burning. While some high-intensity training is healthy and can build fitness, too much is counter-productive. Subjectively, many athletes would say they’re faster, a condition confused with better. Overtraining will make one stronger and faster, at least temporarily, but it’s easy to overdo it. The Big Sugar industry jumped on board too, seizing an opportunity to sell high-sugar low-fat foods and drinks to all those active people under the guise that glucose is the fuel of champions. Refined carbohydrates — junk food — actually is associated with poor health, injury and disease, in part because it impairs fat-burning and builds excess body fat. The result has been an explosion of overfat people around the world, including many who work out regularly. While Cooper’s notion is correct that exercise can improve aerobic and fat-burning function, workouts can easily become anaerobic when the intensity is too high. While these harder efforts may burn more calories during a workout, the process does not train the body to burn more stored fat calories for the rest of the day. You can burn as many calories as you want while running, biking, dancing or whatever, but if they’re sugar calories and not fat calories it won’t reduce stored fat. Today, the Cooper-inspired exercise boom actually is still growing worldwide. However, as the number of people in the U.S., for example, who regularly work out, has risen to more than 50 percent, the prevalence of overfat has increased too, and is much higher. The answer to that paradox is apparent. It’s not the lack of exercise, but rather poor eating habits and the prevalence of junk food that are the real culprits. If you’re serious about your health and fitness you need to work on your diet as hard as you do your workout to achieve optimum results. I’m a fan but this is a very very strange assessment! The records according to IAAF website clearly shows age group record run times are actually getting quicker with few older records still standing! “Moreover, while more people are exercising than ever, a recent study found the result has been impaired health and fitness. Researchers for RunRepeat.com found that runners in all distances from 5K to the marathon are slower than ever, and getting worse. They cited obesity, diabetes, and hypertension as possible causes for this slowdown. In addition even top age-group times are getting slower, with some records now decades old. For anyone interested, I peaked at that records link Spot posted and only 108 (+/- 1-2) predate the year 2000, exponentially less records still stand before 1990. There a few “aging records” hovering around on the year 2000 itself. However, a solid majority are recent.